The facts behind the events in 300: Rise of an Empire, the sequel to Zack Snyder's hit movie 300. The action-packed 300 focused on Ancient Greece's epic battle of Thermopylae, in which King Leonidas led 300 Spartans into battle against Xerxes and his million-strong Persian forces. In the sequel, 300: Rise of an Empire, the action moved to the sea, covering ten years starting with the Battle of Marathon and ending with the massive naval engagement, the Battle of Artemisium, which occurred the same day as Thermopylae. This book tells the story of the real men and events depicted in the movie, focusing on the Athenian general Themistocles, one of the world's greatest warriors. He became warlord of Greece, built their navy and, by uniting Greece to defeat Xerxes' fleet, enabled what we call western civilization. Packed with vivid detail, clashes of arms and ships, blood and glory, Rise of an Empire tells a story even bigger than the big screen could contain. an insightful exploration of the leaders who feature in the film, their backgrounds, motivations, command decisions, struggles, victories and defeats, from the Battle of Marathon through the Battles of Artemisium and Salamis - Xerxes, the Persian king determined to succeed where his father failed, and Themistocles, overcoming monumental hurdles to turn Athens into Ancient Greece's greatest sea power and leading city-state of the age. Before writing this book, Stephen Dando-Collins conducted detailed research of classical texts and inscriptions, at key sites on the ground in Greece, and into Greek warships of the period - with extensive help from the Trireme Trust of the UK, who also advised the producers of 300. 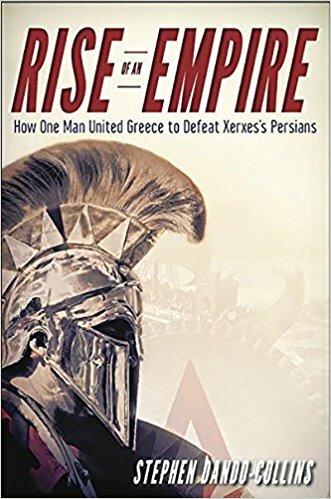 The result is a gripping narrative of the real-life naval battles of the first and second Persian invasions of Greece, with fascinating detail about the ships, the warriors and the tactics, and most of all Thermstocles, the brilliant Athenian commander who saved Greece but fell foul of his own countrymen.